Hans-Jürgen Krahl died in a car crash in 1970, at the age of twenty-seven. By that time he had weathered the rise and decline of the Socialist German Student Union (Sozialistischer Deutscher Studentenbund, or SDS), among whose ranks he was, arguably, both the most sophisticated theorist and, after Rudi Dutschke, the most incendiary orator. The SDS had been founded shortly after World War II as the youth wing of the Social Democratic Party (SDP) of Germany. As the latter moved towards the center, however, the SDS radicalized, eventually leading to expulsion from its parent organization in 1961. It would soon become the most important student group in Germany, even as its official policy shifted further towards revolutionary Marxism.1 Krahl’s historical significance lies in the role he played as a leader of the SDS in the few years immediately before and after 1967-68, when the West German student movement reached its highest pitch. Yet his theoretical contributions are by no means inconsiderable – nor, in any case, can they be divorced from the practical political activities with which Krahl was occupied at the same time. In this sense it may be argued that Krahl brought to a head the distinctive relation between theory and practice that had long been gestating within his milieu. Crucial to the development of the SDS was the attendance of various members, including Krahl, at the Institute for Social Research in Frankfurt am Main. It was here that West German students with little or no personal memory of the Nazi period encountered the early works of Georg Lukács, Karl Korsch, and others, as well as the still-evolving thought of the Institute’s own faculty. As such the Frankfurt School was a living connection to a Weimar-era left that had been utterly destroyed under Hitler. By the same measure it also demonstrated the existence of a Marxist tradition distinct from that of the neighboring German Democratic Republic. New recruits belonging to the Frankfurt School’s so-called second generation, such as Jürgen Habermas and Oskar Negt, further enhanced the Institute’s prestige among would-be anti-authoritarians. Yet for young radicals the Frankfurt School’s legacy was far from unambiguous. Its protagonists had made various compromises merely to survive the preceding decades of Nazism and Cold War reconsolidation. Notably, both Theodor Adorno and Max Horkheimer, the Institute’s leaders, had over the years retreated to positions that came to seem quietist if not openly conservative, at least to students beginning to take cues from the era’s decolonization movements, anti-rearmament campaigns, and protests against the Vietnam War. By the end of the 1960s this led to direct confrontations between Adorno and his own students, most dramatically in January 1969 when Adorno called in the police to break up an occupation of the Institute that had been initiated by Krahl himself. Of the Institute’s prewar cohort only Herbert Marcuse – based at the time in San Diego, rather than West Germany – maintained a consistently revolutionary stance. If, then, the paradigmatic relationship between postwar Germans and their parents was inevitably fractured by the question of complicity with Nazism, by the mid- to late-1960s it appeared that a secondary divide was starting to open between the first and second, or more properly the third, generations of critical theorists. It was in this context that Krahl made his decisive interventions, both theoretically and practically. He began writing a dissertation under Adorno’s supervision in 1965, at the same time as he was becoming involved in the day-to-day operations of the SDS (he had in fact previously belonged to the political Right). Yet by the time of his former teacher’s death in 1969 he was capable of delivering a biting critique of the “political contradiction of Adorno’s critical theory” – in the guise of an obituary, no less.2 Krahl published little during his lifetime. Other than reading notes for personal use, most of his surviving texts are seminar papers or speeches, or were prepared as discussion material for teach-ins.3 Krahl was nonetheless a distinctive voice in the German New Left’s fractious intellectual culture, the flavor of which one can now gather from the pages of journals such as Das Argument and neue kritik, where immediate strategic and tactical concerns of the day tend to lie in close proximity to theoretical discourse at the highest level of abstraction. Krahl epitomized this mobility. In his writing, points that at first seem straightforward often lead to intricate theoretical justification, while dryly philological matters take on the texture of everyday struggle. Nowhere is this two-step more striking than in the notorious speech he delivered jointly with Dutschke at an SDS conference in September 1967, in which analysis of recent economic trends quickly leads to a call for the “propaganda of gunfire in the Third World” to be complemented by “the propaganda of the deed in the metropole.”4 The effect can be vertiginous – “like Hegel on acid,” Anders Ramsay has said.5 Whatever the defects of his prose, though, Krahl’s basic impulse is always clear. The Frankfurt School as he knew it had passed down a trove of theoretical tools, but these had become transfixed in a conservative attitude that denied the dialectical mediation of theory and practice. It was Krahl who most insisted on taking up the legacy of critical theory from the perspective of revolutionary theory (against the likes of Habermas, it bears mentioning), that is to say – to quote the essay translated in this issue of Viewpoint – from the perspective of a “doctrine the propositions of which describe society in terms of its revolutionary transformability.” His work is thus an immanent critique and eclipse of the very intellectual tradition in which he was profoundly immersed. This perhaps accounts for the somewhat estranging effect of many of Krahl’s essays. In his collected writings published posthumously as Konstitution und Klassenkampf (Constitution and Class Struggle), it may seem that he is only juggling quotations, or drawing links from one Marxist authority to another, yet his conclusions are always, inevitably, nothing if not radical with respect to any given political conjuncture. Precision and philosophical rigor sometimes give way to polemical effect; on the other hand, concrete analysis often bogs down in obscure jargon. Yet, if this is regrettable, it is also the surest index of the intensity with which Krahl set himself to the work of building a theoretically ambitious post-Frankfurt School Marxism adequate to the upheavals of the few years in which he was writing. So it is with the text at hand, “The Philosophy of History and the Authoritarian State.” (The German title, slightly different, is “Zur Geschichtsphilosophie des autoritären Staates.”) Krahl’s aim here is to review Marxist theories of the state – specifically, of the authoritarian state during periods of economic crisis – in order to better describe the possibility of revolution in his own moment of the late 1960s. This effort takes the form, notably, of a recovery of Max Horkheimer’s essay on the topic from 1940 – one of the author’s most insistently radical statements, which was read feverishly by anti-authoritarians in the 1960s (much to the older and more conservative Horkheimer’s displeasure). We hope Krahl’s piece will speak for itself, in spite of its difficulties, and hence we will merely gesture at the problems it seeks to address. The following strike us as among the more significant: the changed relation of base and superstructure in late capitalism; the necessity that historical materialism apply its method to itself; the obsolescence of the traditional Marxist critique of voluntarism; the degeneration of Marxist theory following the revolutionary wave of the early twentieth century; and the status of both fascism and the welfare state as intermediaries between capitalism and socialism. The piece covers tremendous ground, then. Not everything is equally well developed. Hence the reader is encouraged to approach this essay in part as a snapshot of Krahl’s thinking caught in midair. Krahl’s description of the authoritarian state is in most ways the application of Horkheimer’s theory to a specific historical situation, defined by what Krahl would describe – informed in the first instance by Lenin’s analysis of imperialism – as the shift from competitive to monopoly capitalism. In contrast to the clear influence of Horkheimer on Krahl’s concept of the authoritarian state – he even bookends the essay with quotations from Horkheimer – the main source for his understanding of monopoly capitalism is not specifically stated; it seems instead an amalgamation of classic works by the likes of Engels, Lenin, and Hilferding molded by the many postwar proponents of the monopoly capitalism thesis. While frequently named in the essay, the term “monopoly capital” is, notably, undefined by Krahl. This is no doubt a reflection of the particular West German radical milieu in and to which Krahl was writing, one that took it for granted that capitalism had entered a new historical stage defined by monopolistic business interests. There were (and continue to be) varied takes on what monopoly capitalism is, but to give a sense of Krahl’s intellectual context we might do well to gloss the influential work of Paul Baran and Paul Sweezy, whose 1966 book Monopoly Capital left a profound mark on the German New Left’s Marxism.7 According to Baran and Sweezy, the world following the Second World War was dominated by large corporations protected against competition from smaller upstarts by government intervention. In such a landscape, states worked together with enterprises to create sites for absorbing economic surpluses generated during the so-called golden age of capitalism, although these outlets were most often military endeavors and the financial sector. Krahl’s understanding of monopoly capitalism certainly encompassed more than Baran and Sweezy’s book; and given his study of value theory, Krahl likely even took issue with their controversial notion of “economic surplus.” Yet the point to be made here is this: the authoritarian state of interest to Krahl is the state formation proper to monopoly capital. As he explains, the authoritarian state consists of the entire “repressive instrumentarium” necessary “to delay definitive economic collapse and to sabotage the real possibility” that unified struggle by the proletariat could bring an end to capitalism. Ultimately Krahl’s theory of the authoritarian state amounts to less a revision of Horkheimer – or, for that matter, Marxian understandings of the state – than a refusal of past theories of the crisis and collapse of capitalism, as well as what he names in a related essay the “fatal social democratic ideology of the Second International that predicted capitalism would bring socialism into being by natural necessity.”8 Such traditions had lost their luster in the years since the First World War, though certain of their precepts continued to hold sway among the intellectual mentors of the German New Left, many of whom looked askance at the younger generation’s political will and worked intensely to convince them to change course. It is into this discourse that Krahl looked to intervene. This is the crux of what Krahl’s essay contributes to the theory and praxis of his time. It is a critique of the critiques of voluntarism that faced West Germany’s anti-authoritarian Left. But here we run up against the trickiest aspect of Krahl’s argument. At the time he was writing, critics of the monopoly capitalism thesis, like Paul Mattick, charged its proponents with suggesting that the government intervention made necessary by monopoly capitalism could also make the possibility of abolishing economic crisis and collapse a reality. In his 1966 review of Monopoly Capital, Mattick insisted that even if one were to accept the fleeting actuality of monopoly capitalism, the state that supports it could only be “capable of postponing, but not of abolishing, crisis conditions.”12 Whether Mattick is correct in his accusation that Baran and Sweezy argued state intervention could eliminate the possibility of crisis is certainly beyond the scope of Krahl’s essay. Yet it does force us to ask a question that may nag contemporary readers of “The Philosophy of History and the Authoritarian State”: does Krahl’s description of the authoritarian state take as a premise the possible end of capitalist crisis? Unfortunately, on this topic, the present essay is ambiguous. But keep in mind, the West German recession of 1966, which marked the end of the so-called postwar “Economic Miracle” and reintroduced the country to the vicissitudes of capital accumulation, was still fresh in the memory of the New Left. It was clear to most, Krahl included, that the possibility for economic crisis surely had not passed. And yet Krahl joined the ranks of those who viewed the formation of the Grand Coalition between the SPD and CDU as partly a political response to the return of such economic turbulence. Thus, instead of accepting the authoritarian state as what Krahl describes here as “capital’s political exit from the economic crisis,” we might better grasp it as the “repressive instrumentarium” that allows capital to mediate economic crisis politically. Over half a decade into the current global crisis – itself the postponed fulfillment of the crisis of the 1970s – evidence of its mediation by the state is everywhere and takes varying forms, from so-called austerity measures to the militarization of police. There is no way to “fix” capital, and there is certainly no fixing it via state intervention. Every measure the state takes to solve the current crisis and prevent its recurrence will only favor capital. As Krahl might have insisted, the only hope we can place in the state is the chance to destroy it. But alas, destroying the state – even the authoritarian state – will never, on its own, bring about the destruction of capital. By the same measure, though, neither will economic crisis automatically lead to the overthrow of capital’s state. “The Philosophy of History and the Authoritarian State” ought then to be considered in tandem with Johannes Agnoli’s contemporaneous work on the same topic, some of which is also translated in this issue of Viewpoint: they are joint attempts to advance a theory of the state that does not succumb to one variety or another of Marxist reductionism (the state as either fully autonomous from, or fully subservient to, the interests of capital). As such, the essay can also legitimately be considered part of the prehistory of the 1970s “state derivation debate,” in which context these matters were to be theorized at much greater length. It was precisely to, or against, interventions by Krahl, Agnoli, and their contemporaries around 1968 – in addition to the orthodox theories of the state emanating from both eastern and western Communist Parties – that thinkers such as Claus Offe and Elmar Altvater were to respond a few years later. It is also these slightly later developments that help to fill out what is a missing link in Krahl’s writings on the state. His greatest theoretical legacy, in fact, does not lie in this field at all: it was rather the themes broached in Krahl’s attempts to reconstruct the logic of the commodity and its value-form that were to be taken up in the body of discourses known as the Neue Marx-Lektüre (New Reading of Marx, or NML), value-form theory, and the so-called “capital-logic” school.13 This is in part a matter of convergent evolution rather than direct filiation. 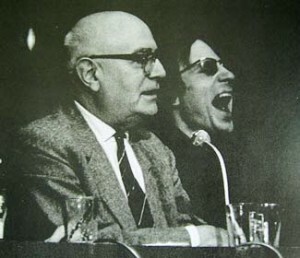 Like Krahl, Hans-Georg Backhaus and Helmut Reichelt (key names in the early history of the NML) had studied with Adorno in Frankfurt; in all three cases, the events of the 1960s stimulated a return to the basics of the Marxist critique of political economy, at the expense of the cultural preoccupations that had dominated much of Adorno’s later work. Their point of departure was therefore similar. Backhaus and Reichelt, though, have had the luxury of another forty-odd years to further develop the implications of their early insights. Krahl was not so lucky. His untimely death in February of 1970 deprived the SDS of one of its brightest stars. By then, though, the organization was already on its last legs. The era of the K-Groups followed soon thereafter – miniature Marxist-Leninist parties, generally also Maoist in orientation. The “anti-authoritarian” student revolt was then mostly liquidated in favor of supposedly necessary revolutionary discipline. Or else it flipped over into armed struggle, or diffused into the anarchistic Sponti (“Spontaneist”) scene, or into the apolitical counterculture. There was also, of course, what remains today the most lasting political legacy of the German New Left: the “long march through the institutions,” the path of which led directly to founding the Green Party, who, like the SPD before them, would prove their willingness to govern alongside the Christian Democrats. The personnel responsible for these developments had in many cases passed through the SDS orbit. Subsequent contributions to German critical theory also often read like a who’s who of its former activists. But the unity that the group had once provided was irrevocably lost. The SDS itself dissolved barely a month after Krahl’s decease. Though collected and published the next year, his writings of necessity quickly passed into the realm of the merely historical.